One of the biggest nuisance pests for cherry growers are birds. 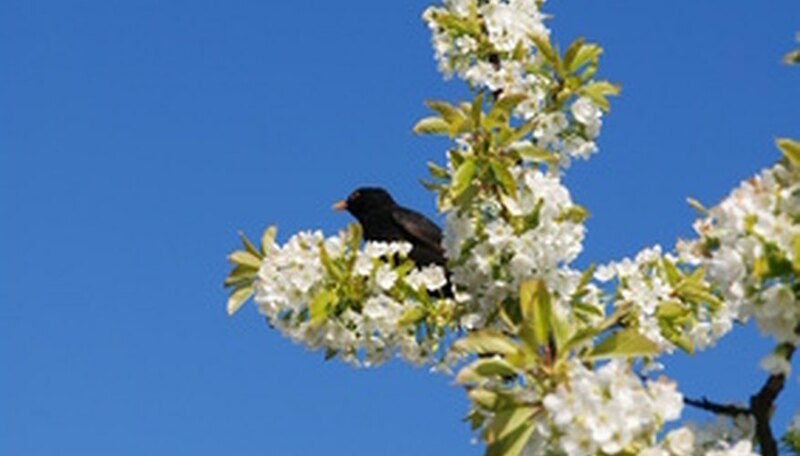 Birds are drawn to the tart and sweet cherry trees, and can decimate a harvest before the cherries are ripe enough to pick. Most cherry trees are too large to cover with a protective netting, but there are still steps you can take to keep birds away from the trees. Count the major branches in your cherry tree and gather that same number of aluminum pie tins. Punch holes in the edge of each pie tin with a screwdriver. Thread a string through the hole and tie a secure knot. Loop the string over a main branch and adjust it so the pie tin hangs freely. Tie the string securely to the branch and cut off the excess string. The pie tin will reflect light and distract the birds. Thread an entire spool of black sewing thread through the branches of the cherry tree to create a confusing maze of string. The birds will not like the feeling of the string on their feet, and will avoid the tree. Set plastic snakes in the branches of the tree and tie them down with string. Set a carved owl near the tree, either on another tree or on a nearby building. The presence of fake predators will scare the birds away.